Show friends and family members who have been impacted by the devastation associated with Alzheimer's disease your full support when you wear this Alzheimer's shirt at your next awareness walk. The bold design will pique others' interests in learning more about this disease. 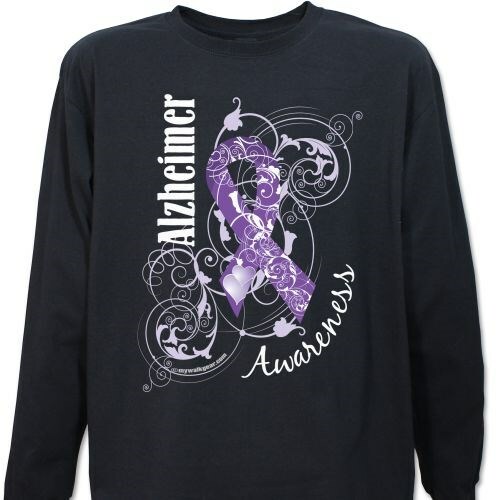 This Alzheimer's Awareness design is printed on one of our premium 100% cotton long sleeve shirts, machine washable in youth sizes S-L and adult sizes S-2XL. I absolutely love the pink color of this shirt, it is very comfortable, is just how it was described. Excellent shirt! Fit is perfect! Additional Info Our wide variety of Alzheimer's awareness gear will help you spread the word about this important cause at your next walk. This eye-catching shirt will look fantastic on your walk team. Our Tackle Alzheimer's T-Shirt is another great design for your next walk.